I think this simple little craft turned out very cute! Thanks to Sally, one of the viewers, for suggesting/requesting it. The craft is simple enough for young kids to contribute but still fun for even mom to make (I like doing the tissue paper version but it's tough for preschoolers to make -- the templates are more appropriate for them). 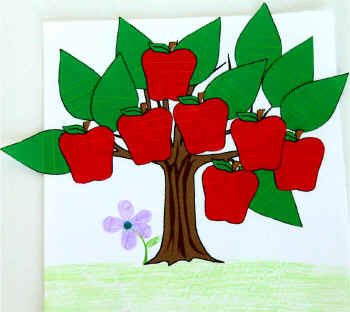 Template Version (younger children): print the trunk template and the leaves template and paste them together. 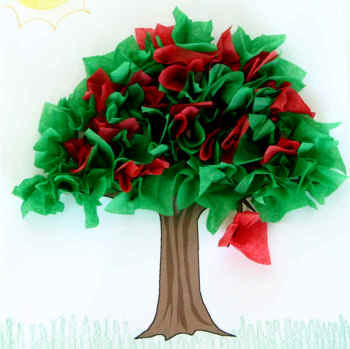 Tissue Paper Version (older children): cut 1.5 inch squares of tissue paper, wrap around the eraser end of a pencil and glue to the trunk template. something to colour with (for B&W version and to add grass, sun, etc). tissue paper in red and green (about 1/2 a standard sheet of green and 1/4 of red). Standard pencil with an eraser. Colour pieces, as necessary. (For a change of pace, try using different mediums than you typically do, such as paints or pastels). Cut out the apples and leaves. This step may require adult assistance. We didn't cut out our trunk -- we just decorated the template page with the trunk on it. Glue the leaves onto the tree. I like using a glue stick for the template pieces. Glue the apples onto the tree. I like using a glue stick for the template pieces. Use crayons, paints or collage materials to further decorate the page (with green tissue paper for grass and white cotton balls for clouds works very nicely!). Print out the trunk or make one by tracing the child's hand (with finger's spread) and arm about half way up to the elbow. Colour the trunk if using the B&W version. (For a change of pace, try using different mediums than you typically do, such as paints or pastels). Cut green and red tissue paper into 1.5 inch squares. We put all our squares in a margarine container so they wouldn't fly around and make a mess when someone walked by our work space. Squeeze glue on about 1/4 of the tree (liquid glue works much better than a glue stick for this project) . 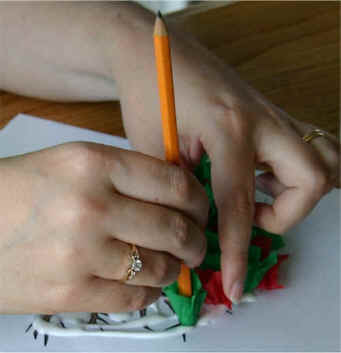 Wrap a tissue paper square onto the eraser end of a pencil. Place the tissue paper onto the tree by pushing the eraser end of the pencil (wrapped in tissue paper) onto a spot with glue. Continue placing squares of tissue paper, mixing the colors, until the tree is nice and full.